The height of apple season is arriving in Maine. Apples are one of the sweet treasures that distract us from the end of the glorious summer, and Friday I surrendered myself to distraction. 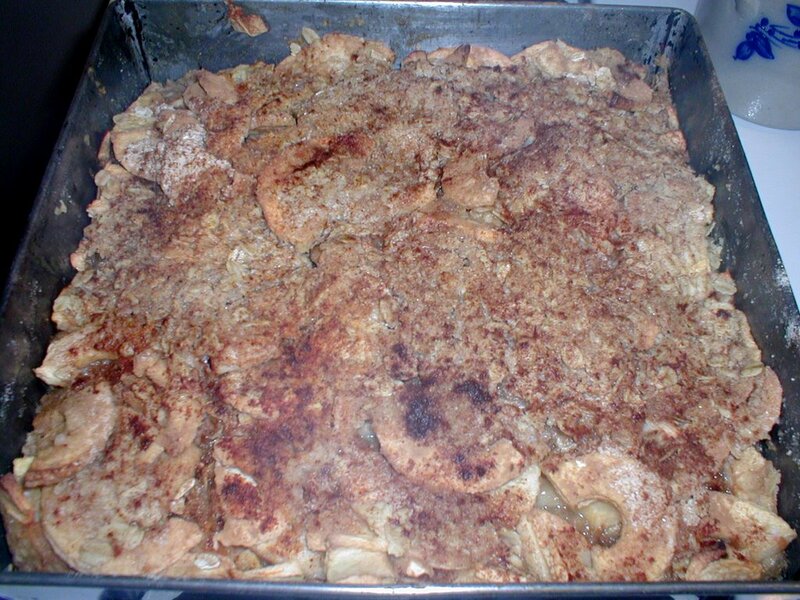 The weather Friday was cold and blustery, the perfect day for a delicious apple concoction to be baking in the oven, scenting the kitchen with apples, cinnamon and sugar. On the way home from work, I stopped at the Pleasant Pond Orchard to buy some good baking apples. Food snob that I am, a bag of utility Macs from the supermarket just won't do -- I like to cook with a mix of apples, heavy on the heirloom varieties, with their complex, sweet, winey tartness. Pleasant Pond Orchard grows over 30 varieties and I enjoy several trips there every fall, talking about apple varieties and tasting many with one of the owners, Mary Alioto. We had a good chat, and I tasted some yummy varieties. 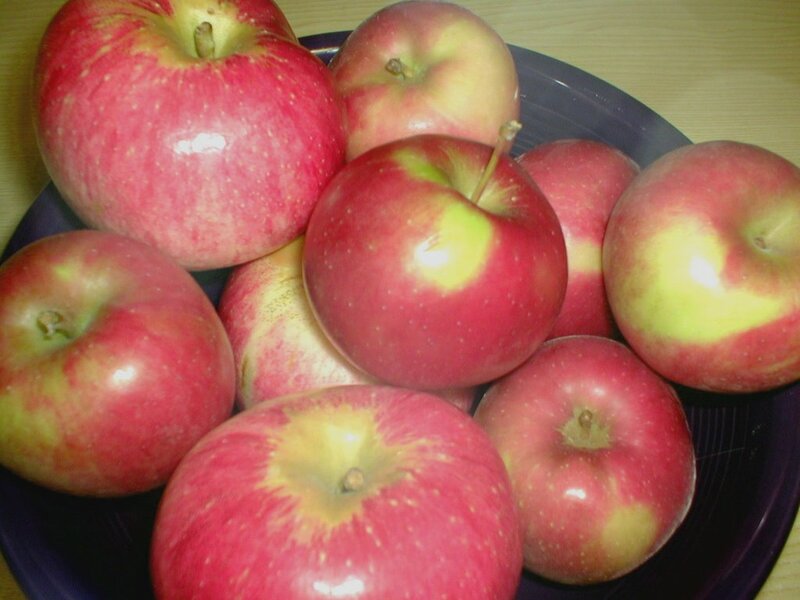 It is still early apple-wise, but I came home with a mix of Wolf River, Winesap and Spencer apples. Some of my other favorites, Gravenstein, Northern Spy, and Pippins, are still to come. 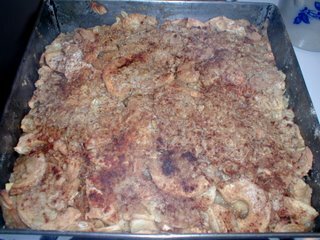 I decided to make my mom's apple crisp, mixing the three varieties and throwing in some Macs I had at home. 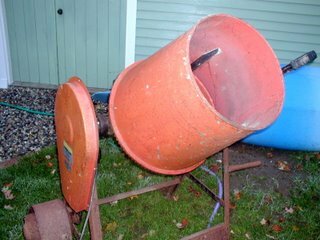 Over the summer at a tag sale, I found something I've been eyeing for quite a while, an old-fashioned Yankee Apple Peeling Gizmo. Purported to peel, core and slice the apple while I simply cranked, it seemed too good to be true. With all those apples, (I like LOTS of apples in my crisp) I decided to take it for a test drive. The first disappointment was that the clamp mechanism did not open far enough to clamp onto my counter, hmmm. (Newer ones use a suction base.) I solved that by clamping the Gizmo onto the edge of my breadboard, allowing just the edge to hang off the counter. 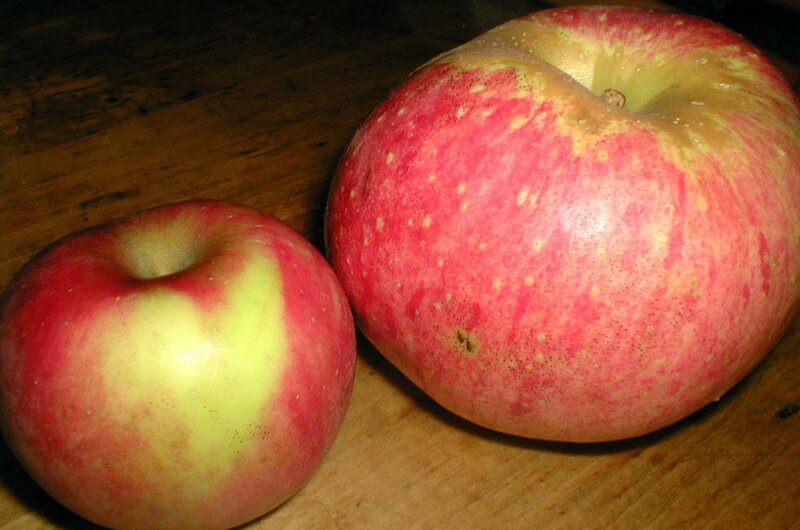 The second disappointment was that the huge Wolf River apples (sometimes called pie apples because just one is enough for a pie), were too large to fit in the mechanism. I perservered, though, and with the smaller apples, the peeler worked a treat! 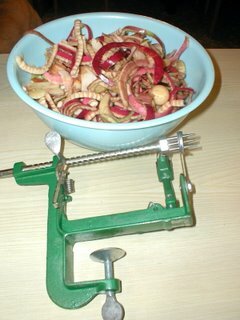 In no time I had a large bowl of apples all peeled and ready for the topping. I LOVE the Gizmo, and best of all, it was $1. Tag sales rule. The mix of apples was delicious, a complex blend of sweet, tart goodness. I love reading of the history of these heirloom apples, a fascinating read on the topic is Apples of Maine by George Stilphen. The FEDCO tree catalogue is another mouthwatering source of information on apple varieties, including not only cooking apples, but expanding into historic cider apples. It's a darn good thing my lot is only 3/4 of an acres, because after reading the FEDCO catalogue, I'm ready to plant an orchard. I'll take one of each heirloom please -- you can keep the modern apples. 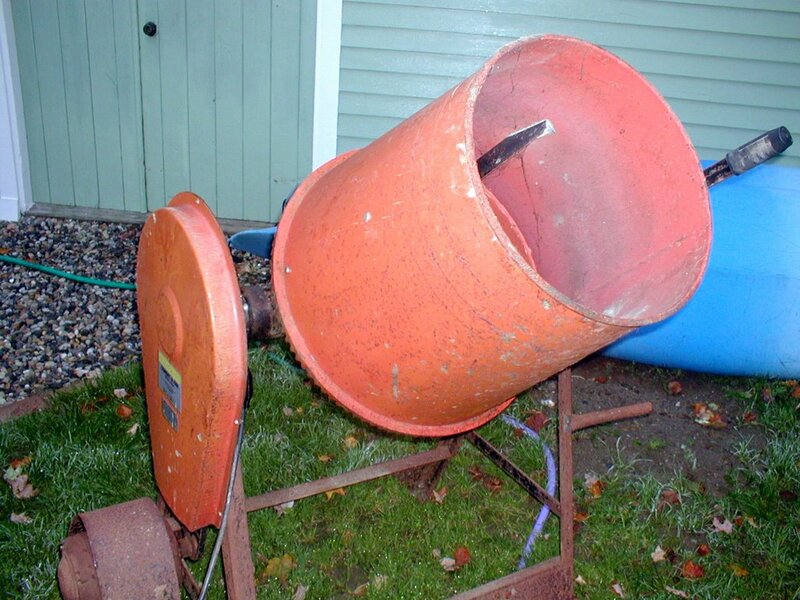 Last Friday, Dan came home with home a big present for me, my very own cement mixer. It is beautiful. An electric model, it was carefully maintained by its previous owner, and is in excellent condition. Dan saw the mixer set out at then end of a driveway on his commute home from work. It hadn't been there in the morning. He pulled over, and talked to the owner, who said "I just set that out, no more'n an hour ago." Fortunately, it isn't that heavy, so the two of them were able to load it in Dan's truck. This isn't the first treasure my sharp eyed husband has spied at the edge of the road. Last summer we saw a nice double-bowl cast iron sink sitting at the edge of someone's lawn with a free sign attached to it. We screeched to a stop, and the next weekend constructed a stand for the sink out in the garden to wash vegetables before they come in the house. Next summer, we'll run a dedicated water line right out to the sink. One day last fall, Dan came home from school very excited with his latest find --the antique side windows from the front door of an old house under renovation. The windows are gorgeous, about a foot wide and 7 feet high. We've been talking about building a rustic china cupboard for the dining room fo some time -- these windows are perfect for that purpose --and did I mention these were also free? Of course all these treatures add to the already endless list of projects we have in mind for someday (the china cupboard, a new front step, a new foundation for the garden shed, paved paths in the gardens, etc., etc. ); fortunately, we have a big barn. I do hope we can build the china cupboard and the new range hood cabinet over the winter. It would be good to get that done so that we can concentrate on our concrete projects next summer. I can hardly WAIT to get to work. Chris over at All Things Maine posted this link to a story in the Lewiston Sun-Journal. It seems the LSJ is asking the gubernatorial candidates to put their gills in the water with regard to the water quality of Maine's Androscoggin River. To see the goldfish at the LSJ site, click here. I'll have to check in with the LSJ more often --it seems like maybe they are trying to spice up Maine's ever-so-bland news industry. My devoted readers will have noticed the long absences between posts of late. I only wish the cause were the overwhelming zucchini harvest, or a lottery-winnings financed vacation to Italy. 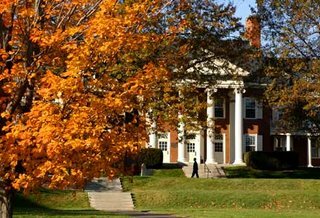 Alas, it is that both Dan and I returned to the world of education, he in his new role as a middle-school technology teacher, I to my role supporting civic engagement efforts at a small college. The adjustment is brutal. It isn't that we don't work like dogs during the summer --if you've been reading closely you can surely discern that; rather that during the summer, our routines subtly adjust to the conditions --up with the sun, slow down at noontime, work in the barn on hot days, etc. With the start of school, that natural rhythm is completely disrupted. The academic year begins the same way a circus performer is shot from a cannon --BOOM! The pace is occasionally frenzied, frantic much of the time, busy all the time. You drag yourself home at the end of the day, look at the dog, then look away from the eager face and pretend not to feel guilty that he's not going for a walk again. Picking the tomatoes and beans is all you can muster in one evening, cooking them waits for the following night. Gradually, you adjust to the pace as the semester settles into its more typical rhythm. You can cook a more complicated dinner. A Friday arrives and you feel like you can stay up past 9 pm and watch a DVD. And suddenly, you have something to say again on your blog, and the energy to type it in. Food Policy, or Food-born Pandemic Policy?? This spinach scare is, I hope, opening a lot of previously closed eyes to the travesty that is big agriculture in this country. Those amber waves of grain we sang of in elementary school have become factory farms, polluting our fruited plains and causing millions of animals to live in cages or fetid cesspools known as feedlots before meeting their often painful and terrifying demise at the slaughterhouse. "We now truly do have "factories in the fields." And factories, whether manufacturing steel or frozen peas, generate waste -- in agriculture some 1.4 billion tons per year, 10,000 pounds for each American," write Al Meyerhoff and William B. Schultz in an article in Sunday's Washington Post. 10,000 pounds a year!!! That is insane. Meyerhoff and Schultz should know. Meyerhoff is a past director of the Natural Resources Defense Council public health program, and Schultz was an FDA deputy commissioner. Are we lemmings fleeing frantically for the cliff of a giant food-born illness epidemic? We need to wake up and vote with our grocery budget. It is way past time to send a message that we have had it with the relentless cost cutting of multinational retailers, and the blind eye and ostrich attitude of our government to these inhumane, unhealthy food safety (and I use that term loosely) practices. Support your local farmer, who is working hard just like you are, to feed his family and protect her land, water, air, and children from the environmental ravages of factory farming. Go to your local farmers market, and get some delicious, local, fresh, healthy food. 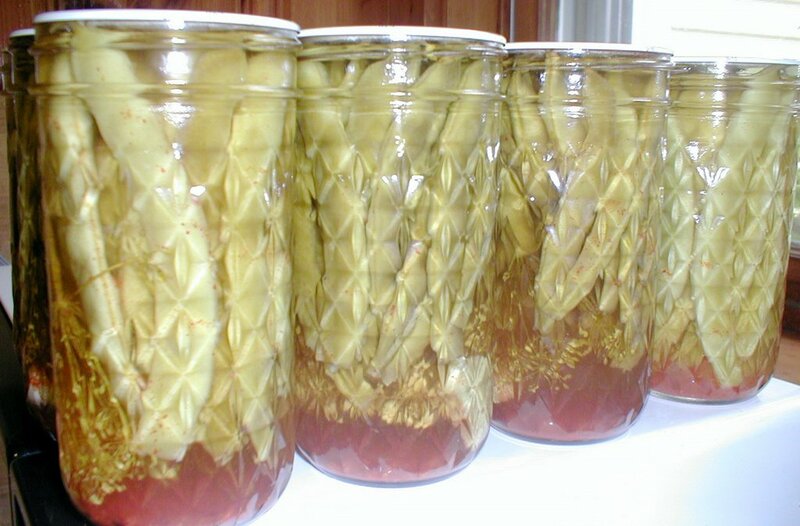 It will taste great, and in the long run, cost a lot less, and make you feel a lot better. We made dilly beans this weekend. Vinegar, salt, dill, garlic, cayenne pepper and green beans steeped over the winter, and served on a bleak day in March are a vivid reminder that winter will end, and spring will come, and green beans will grow in the sunshine of the garden. We made them with the pole beans grown from the seed given to me by my colleague Michael. I've never used pole beans for Dillys before, but I can't see why they won't be equally fabulous. Our dill suffered a chicken related tragedy early in the season, and the replanted dill isn't ready, so I purchased dill at Goranson Farm. The fragrance was amazing, filling the car, then the kitchen. How long before March? Thursday in the Food Section of the New York Times was an article about the challenges of shopping in the city supermarket. While on the one hand, I found the article a lament for food snobs everywhere, there certainly were strong elements of truth in the article, and its companion for food snobs, The Best Pantry Basics list. "Somewhere in the vast selection of jarred tomato sauces, Cheddar cheeses, baked beans and dairy-case puddings, I knew there must be food that is reasonably wholesome and possibly delicious," the author, Julia Moskin, wrote. "I limited myself to short ingredient lists and minimal use of artificial preservatives, sweeteners and partially hydrogenated oils." She has a point. I am, after all, something of a food snob myself, not content with the wares of the local supermarkets or even the local farmers' market. No, I must grow it myself, cook it from scratch, grind my own flour -- oh wait, that's Martha. This obsession has paid off in terms of my spinach consumption, I might add. Seriously, though, have you read the ingredients on the label of a jar of Ragu lately? Or frozen or fresh pasta, salsa, soup, stew.... you name it. High fructose corn syrup, hydrogenated fats, sodium, BHT, you name it, yeesh. And often the second or third on the list (meaning lots of it) is the high fructose corn syrup. I was surprised to find a number of items on Julia's list that appear regularly in my cart, too. Stoned Wheat Thins (crackers), B&M Baked Beans, Cabot Sharp Cheddar (I prefer the Hunter's Seriously Sharp, myself) and a selection of ethnic ingredients such as coconut milk or chipotle chiles. What really surprised me, though, was the brevity of Julia's lists, and the realization that I agree with her. Most prepared food has become so bad that I just won't buy it anymore. Gone are the days when a jar of pasta sauce could provide a quick nutritious meal after work. On those days, it's Teddy all-natural peanut butter on homemade bread. I will say, though, that I do still enjoy my B&M Baked Beans, made in Portland just 35 or so miles from my home. I love driving into Portland and smelling the beans baking. I do think they are sweeter now (and wish they were not) then they were in my youth when I ate them regularly, as good old Maine tradition calls for, on Saturday nights with brown bread, coleslaw, and red hotdogs. 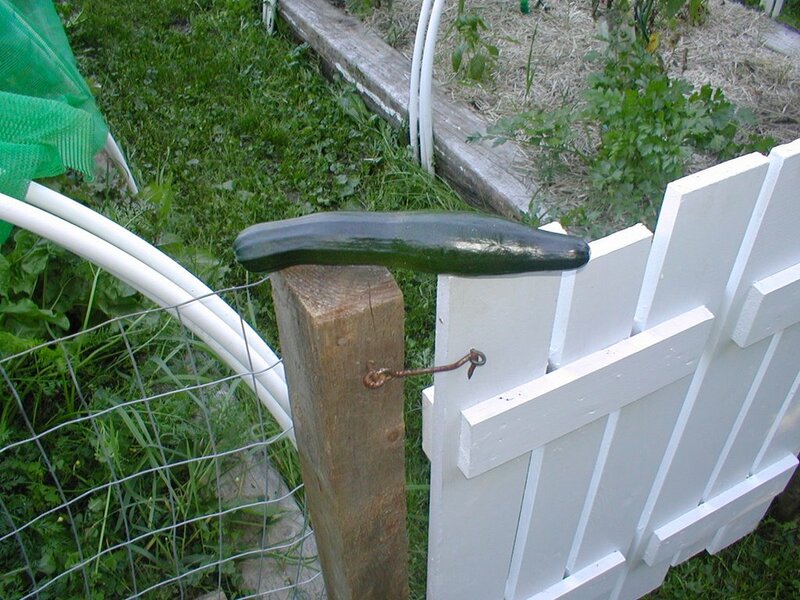 In August, I lamented my failure to grow even one zucchini successfully this year. Success, however, has not eluded me, at least not success with zucchini. Earlier today I spied a zucchini squash hiding amidst the leaves of the volunteer squash plant growing in the compost pile. Hooray for the compost pile!! And on another note, isn't the gate seen in the photo cute? Dan made it from some old window shutters found at a tag sale.... Go Dan! 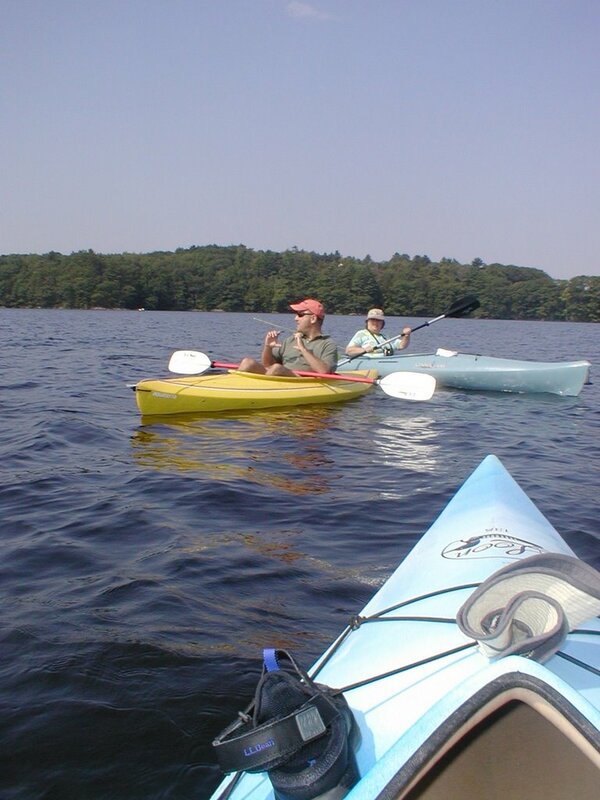 Sunday afternoon, we loaded up the kayaks and drove south about 8 miles to Bowdoinham for a paddle on the Cathance River downstream to Merrymeeting Bay. 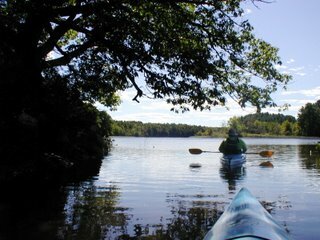 Merrymeeting Bay is an incredible inland estuary formed where 6 rivers meet and merge into one, the mighty Kennebec River, which continues its travel to the ocean at Fort Popham and Popham Beach. Merrymeeting Bay covers about 9,000 acres and has a tide of 5 feet, even though it is 17 miles from the ocean. 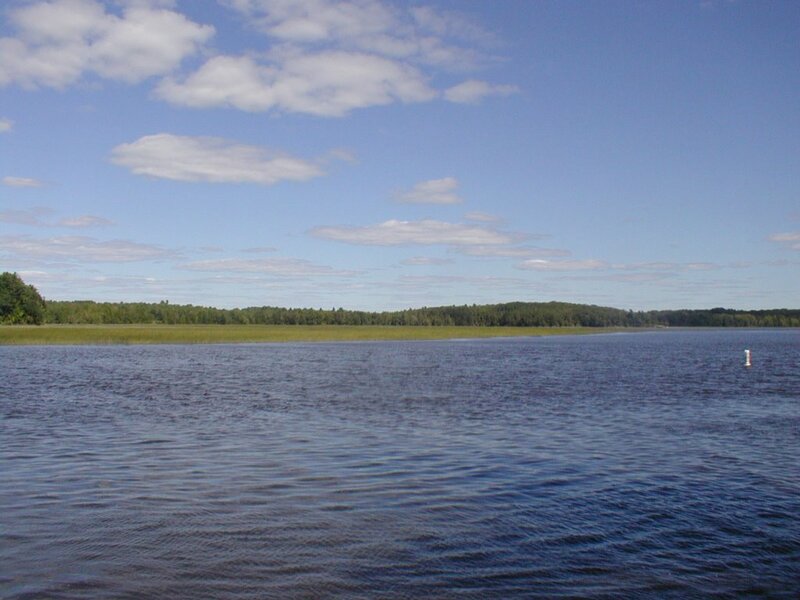 It is an important habitat for wildlife and a glorious spot for birdwatching. 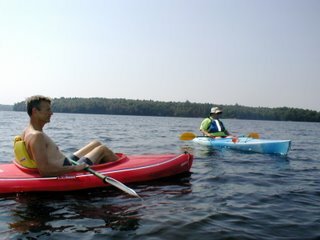 We put in at the Bowdoinham Town Landing at about 12 pm, and paddled downriver on the Cathance toward the Bay. The tide was coming in, and mitigated any advantage of paddling with the current. We weren't rushing, stopping to poke about in a few places, and we were paddling against the wind for much of the way; we got to the edge of the Bay at Center Point at about 1:40 pm. We aimed for some granite ledge, planning on getting out to stretch our legs. 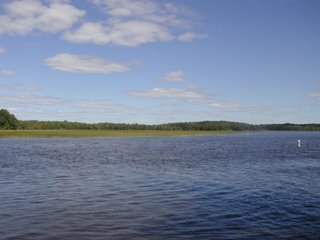 As we approached, a mature bald eagle took flight from a pine in front of me, dropping lazily toward the water before stretching his wings and flying off. The bird was less than 15 feet away, and the sun was at its back shining through the wing and tail feathers; it was an amazing sight. We stretched our legs and drank some water, looking about at this gorgeous place. In the fall it must be an incredible sight, filled with migrating waterfowl stopping to feed on the wild rice along the shore of the bay (see the rice on the left in the bottom photo). Climbing back into our boats we again agreed that we are really lucky. Paddling back against the current but with the tide was a snap, the tide pushed us along, requiring mainly paddle strokes to correct direction, and the Bowdoinham Town Landing was in sight in just an hour of easy paddling, we arrived at about 3 pm. We got home in plenty of time to unload the boats and commune with the chickens a bit before dinner. Life is good. Sunday dawned clear and sunny, but feeling guilty, we decided we should paint, and I needed to do some laundry. The kayaks sat forlornly against the barn. We got another 3 eggs from the chickens Sunday. (We now think all of them are laying, even Daisy, our late bloomer. Daisy's comb is growing larger and redder, as did the other chickens' combs before her.) With all these lovely eggs, I decided a quiche was in order, which makes a terrific brown bag lunch. 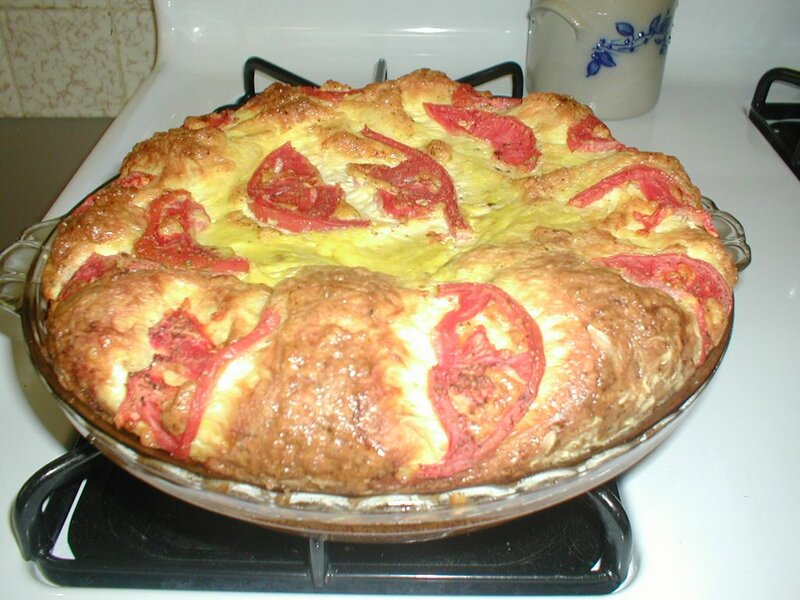 This one is Tomato and Swiss Cheese. 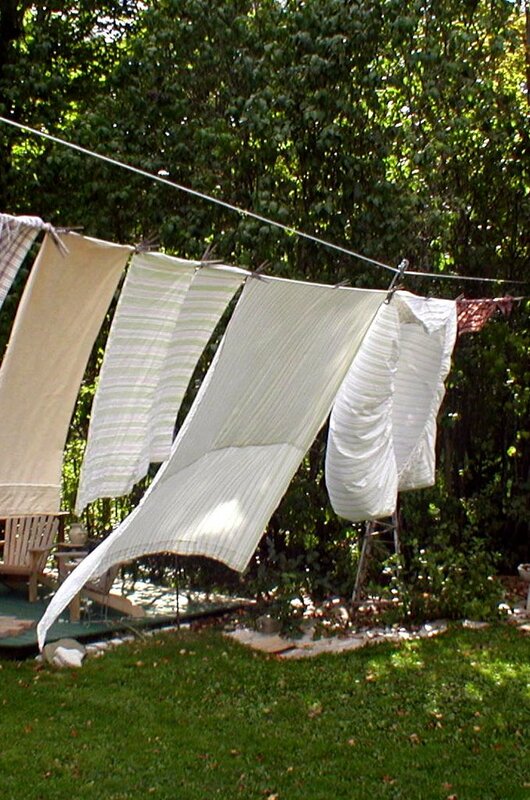 I did another load of wash, and hung it on the line in the sun as the quiche was cooking. (I love the scent and feel of cotton sheets dried on the line). While I was cooking and laundering, Dan painted the back wall of the barn. Just as I took the quiche from the oven, he came in and said, "It's a really nice day, maybe we should take the boats out." At last, the weekend arrived, and the weather was beautiful. After a cold and gloomy Labor Day weekend, I was longing for good weather and the chance to get on the water once again. The weather forecasts sounded good...then not so good... then cold and rainy.... Clearly, the weather pattern was unsettled and we would just have to hope for the best. 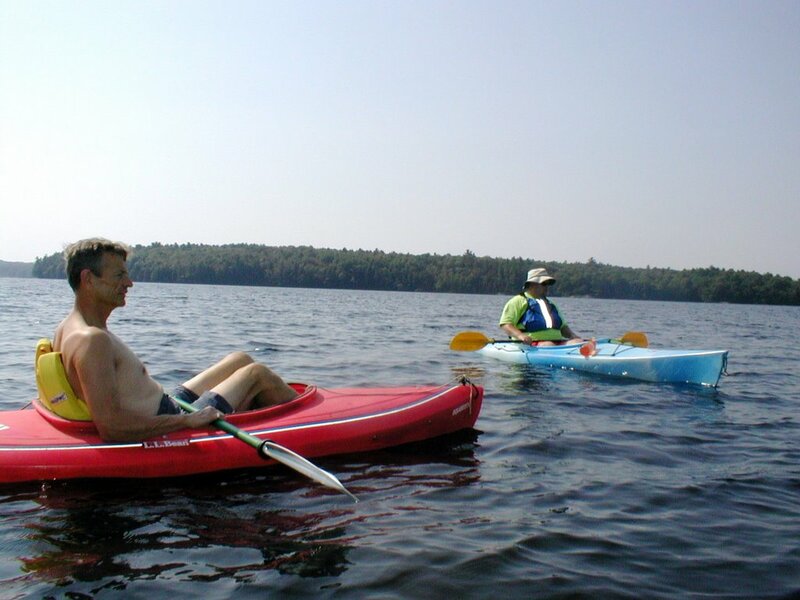 When our friend and neighbor Karen learned we had kayaks, she agreed with alacrity to bring her kayak home from her family's camp, so we could paddle together. 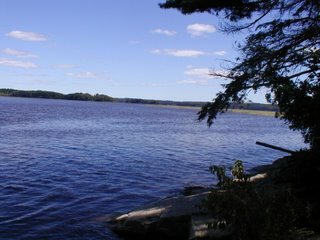 We proposed another trip to Nequasset Lake, to show it to Karen. Other friends heard about the trip and joined us, and on Saturday we all met at the lake for a day on the water. Karen tried to catch us some lunch with her fly rod, but alas, the fish weren't cooperating, so we made do with our picnic lunches, which, seasoned by sunshine, fresh air and friends, were delicious. 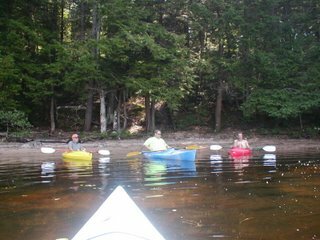 We all agreed we are incredibly fortunate to live in such a beautiful place, with the beautiful natural resources that surround us, and good friends to share the fun. We spent about 6 hours on the water, and I learned the painful lesson that yes, I sunburn easily, even in September. 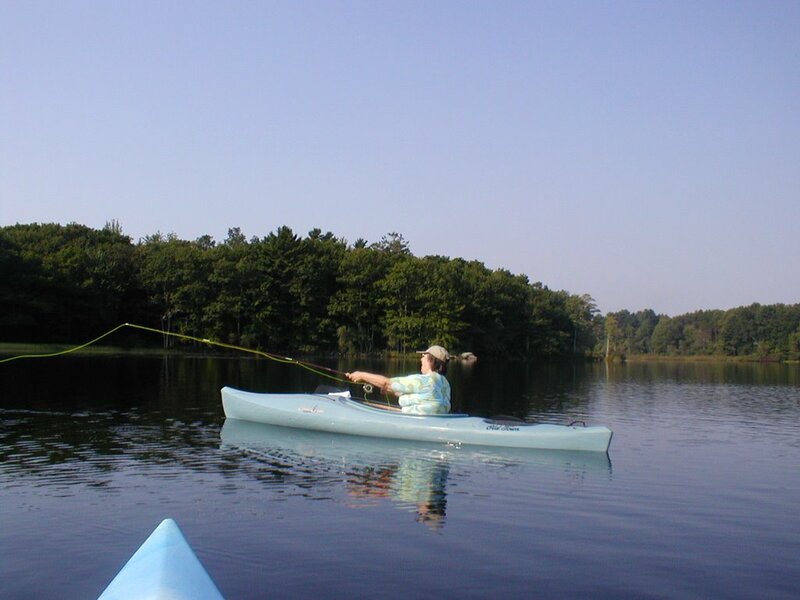 Nonetheless, we'll be back on the water soon. House chores can be done when the snow is on the ground. I've_always loved rocks. I know, I'm weird, but I've been collecting rocks since I was old enough to grasp one in my hand. One of my earliest memories is of stopping at Perham's Maine Mineral Store in West Paris on the way to visit family up north, and running my hands through an enourmous tub of polished stones that sat in the store, for sale 10 stones for a dollar. 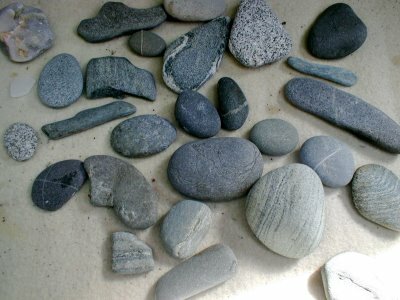 At every beach I have ever visited I've gathered pretty stones, interesting stones, stones with interesting shapes. From Cape Breton Island, we came home with almost perfectly spherical granite stones the size of tennis balls. 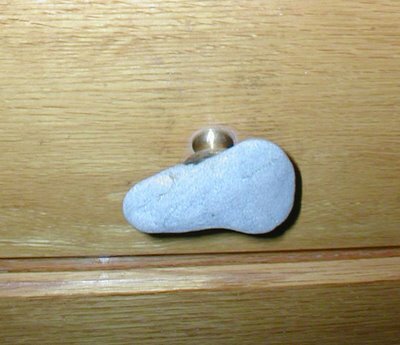 Hiking across the Highlands of Scotland, I found stones with fossils embedded, and added them to my pack -- they now sit on the stereo cabinet, right by the CDs, for people to pick up and touch. I'm especially happy when I find a lucky stone, with a stripe completely encircling the stone. These rocks have traveled with me for years, and sure enough came with me when Dan and I bought our beloved house. As I've said before, I love my house. One of the things I did not love about my house, however, were the ugly, cheap, mismatched drawer pulls in the kitchen and bathrooms. Ever since arriving at the house, I've wanted to change them, but didn't know what I wanted. I figured that out several years ago when I saw a bracelet made from Maine beach stones. Lovely as a bracelet, I thought the stones would be equally stunning as drawer pulls, and fortunately for me, I already had an excellent selection of beautiful beach stones, all with happy memories of sun drenched days in Nova Scotia, Popham Beach, the Scottish Highlands, or on Cape Cod, attached to them. Of course, this project could not be as easy as it sounds. I had the idea, I had the stones, now, how to create the pulls? Finally, earlier this year, I discovered the perfect thing, insert knobs from Lee Valley Tools. The brass knobs had a wide, shallow depression which could be filled with 2-part epoxy and the stone set into the depression. I needed 23 knobs for the kitchen, 5 for the upstairs bathroom, 4 for the downstairs bathroom, and 10 for the handle-less chest of drawers purchased at a tag sale. I purchased the brass insert knobs, and got started. It worked amazingly well. I managed to complete the kitchen, the downstairs bath, and the chest of drawers, but I ran out of appropriately shaped stones before I could finish the upstairs bathroom. Living in Maine, less than 50 miles from my choice of several stunning beaches, one would think it would have been a simple matter to go rock hunting one day and finish up. One would think. Ten months later, Dan and I finally managed to collect more stones from one of our favorite spots on the Maine coast. Now all I need to do is find the epoxy, pick out which of the gorgeous stones to use, and finish up.